At IAgrE, we want to make the process of joining as easy as possible. Membership is open to people at all levels. Whether you are just interested in being involved in the work of the Institution of Agricultural Engineers or want to become a registered professional engineer or environmentalist, we have a grade of membership for you. IAgrE members, together with Registered Engineers & Environmentalists are at the forefront of meeting the world’s most pressing challenges and ensuring society’s continued well-being and prosperity. Achievement of CEng, IEng, EngTech or CEnv status recognises your expertise and hard work. You can JOIN NOW as a Student Member or as an IAgrE Affiliate or Technician and use the letters AIAgrE or TIAgrE immediately. 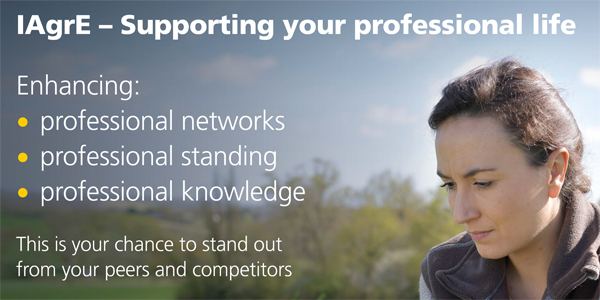 We can then advise you on higher grades of membership and professional registration. If you are already thinking about a higher grade of membership and/or professional recognition, send us an up to date CV. We will then advise you on next steps.